On June 15th, 2017 Michał Krupiński was appointed Vice President of the Management Board, leading the Management Board. From January 2016 to March 2017 he was the President of the Management Board of Powszechny Zakład Ubezpieczeń SA. In this period PZU SA Group increased its market share, founded Towarzystwo Ubezpieczeń Wzajemnych, which successfully gained corporate Customers’ trust, and strengthened its presence in banking sector. In 2016-2017 as a Chairman of the Supervisory Boards, he led the works of PZU Życie Supervisory Board and Alior Bank SA Supervisory Board. 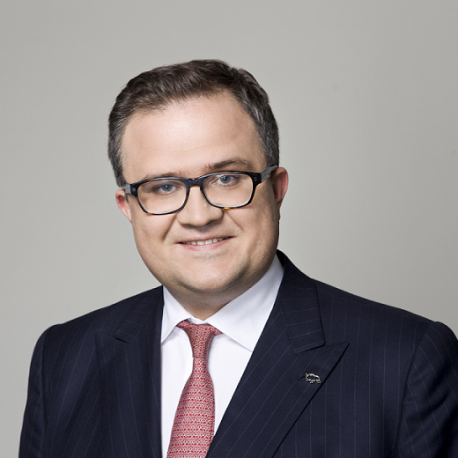 In 2011 he was appointed President of the Management Board of Merrill Lynch Poland and head of investment banking for CEE in Bank of America Merrill Lynch. He was responsible for supervising and leading M&A projects, financing on private and public markets as well as asset management consultancy, investment policy and capital structure i.a. in banking and insurance sector. In 2008-2011 he was Alternate Executive Director – member of Board of Directors of the World Bank in Washington. In 2006-2008 he was Undersecretary of State in the Ministry of the State Treasury, being responsible for i.a. ownership supervision. He graduated from the Warsaw School of Economics (SGH). He graduated with honors from the expert studies at the Catholic University of Louvain. He is an alumnus of MBA program at Columbia University Graduate School of Business, he studied also at the Harvard University. In 2012 he was awarded with the title of Young Global Leader by the Davos World Economic Forum. In 2016 he was chosen the Man of the Year of Gazeta Ubezpieczeniowa magazine. He speaks fluently: English, French, German and Spanish. Mr. Michał Krupiński fulfils suitability requirements determined in art. 22aa of Banking Law Act.